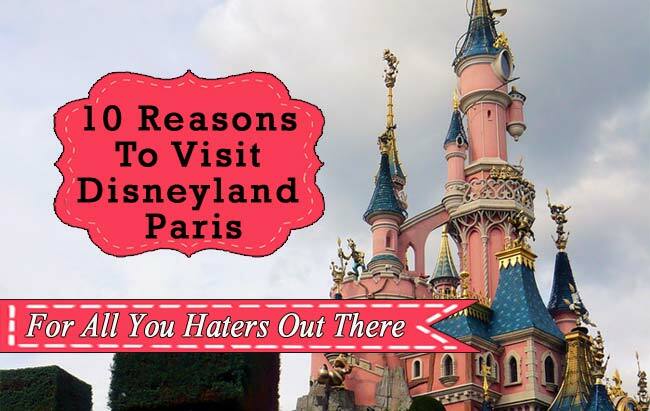 10 Reasons To Go To Disneyland Paris Even If You Are A Hater! >> 10 Reasons To Go To Disneyland Paris Even If You Are A Hater! I’m not really into Disneyland. The price alone is enough to make me choke but then you add in the super long lines, back to back people, princesses, pirates and rides that make you throw up…a veritable laundry list of reason NOT TO GO. So why go then? Specifically, why go to Disneyland Paris? Here are MY 10 reasons why you SHOULD GO, even if you think you will hate it! Before I had kids, I swore up and down that I would never ever take my future children to Disneyland; despite the fact that I begged my own father to take me to Disneyland as a child. – Oh how quickly we forget. My Disneyland abstinence lasted several years until my two sons turned five and six. I still remember the look on their faces when we arrived. It was like they had won the lotto. As I watched them gush with raw unadulterated joy, any and all my reservations and aversions towards taking them to Disneyland melted away. My pocket book felt differently. When my daughter turned 5, we were living in France and it never occurred to me that she might also want to go to Disneyland until one day she just did. I think some of her classmates at school went to Disneyland and told all the kids at school how amazing it was. So once again I am faced with the pressure to take not just my daughter but my sons to Disneyland. I resisted for a while but it is hard to resist my daughters pleas and my then teenage boys seemed to want to go just as much as my daughter. This time I didn’t have such an averse feeling towards taking the kids to Disneyland. Maybe it was because it was Disneyland Paris? Maybe because we didn’t make it an annual thing? Who knows. In any case, I kept an open mind- here are the 10 things that turned me from a semi-hater to semi-lover of Disneyland Paris. Let’s face it, your kids are going to love it. A day of eating junk food, seeing cartoon characters come to life, riding fun rides and seeing cool shows. What kid would NOT like it? 2- Would You Not Go See The Eiffel Tower? Would you want someone to tell you that you can’t see or visit the Eiffel tower? Didn’t think so. In 2010, Disneyland Paris received over 15 million visitors, surpassing the Eiffel Tower as the most popular tourist attraction in Paris? It is also the fourth most visited theme park in the world. So in essence, if you don’t go to Disneyland Paris, it would be like not going to see the Eiffel tower. At least that is how your kids might feel. Space Mountain 2: An updated version of the old ride. If one of the reasons you don’t want to go to Disneyland Paris is because of the long lines, there is a solution. You can always take advantage of the FREE FastPass system. A fast pass allows you to bypass the long line. If you have some money to burn, you could get the VIP fastpass which is like the Fast Pass I mentioned above on steroids. All you have to do is book a room or suite at one of the following hotels: Disneyland Hotel Castle Club, Hotel New York’s Empire State Club, a suite at the Newport Bay Club or Sequoia Lodge. Then use the fast pass all day at any ride that accepts the fast pass. If you’re kids are worried about visiting a foreign country or whining about the trip then taking the kids to Disneyland is a sneaky way to get the kids excited about a trip that they might otherwise not be so keen on taking. The over all look and feel and many of the rides are similar to the Disneyland in the US but there is a definite French Flair to it. For instance, the ride announcement will be in French and english and a few other languages. There are food carts selling fun treats unique to France like Crepes. If you don’t speak French, you will still be able to communicate relatively easy. There are menus, maps and even signs written in French AND English. Many of the park cast members also speak English because they are recruited from all over Europe and the world. One of the things I hated about Disneyland in the US is it was huge. Overwhelmingly huge. Disneyland Paris is smaller, slightly more manageable and doable in a day with some planning. 10-What’s the harm in it or Why The Hell NOT? Sure it’s cheesy. Sure it’s not really culturally “classy” but if you have kids who are dying to go or even a grown up kid who wants to go, they will worship the ground you walk on if you take them to Disneyland Paris. What’s the harm it it anyways? I know part of my own resistance had a lot to do with how other people POO POO the idea of going to Disneyland Paris when you are in Paris. PFFFT! As if going to Disneyland will lower your social status or make you less classy. Stop caring about what other people will think. The worst that could happen is you waste some time and money while your kids, your friends or spouse have the time of their lives. Who knows you might have a great time too or at least enjoy watching your kids have a great time. If you have a week or more in Paris and have kids or people who you are travelling with that want to go, I say GO For IT. Go check out these personal accounts from other people who actually went to Disneyland Paris and see what they thought about the park. p.s. The best times to visit Disneyland Paris is on weekdays outside public holidays and school vacations.